GV-ASManager offre una soluzione di controllo dell’accesso alla rete adatto sia per le piccole imprese e le multinazionali con strutture in tutto il mondo. GV-ASManager offers a network access control solution suitable for both small business and multinationals with facilities around the globe. GV-ASManager can control up to 1000 units of GV-AS / GV-EV Controllers and support up to 40,000 cards. In addition, IP devices can be connected to GV-ASManager through network to provide live video and event associated playback. Note: The Maximum License is a paid service. Note: GV-ASManager does not support 3rd party controllers. 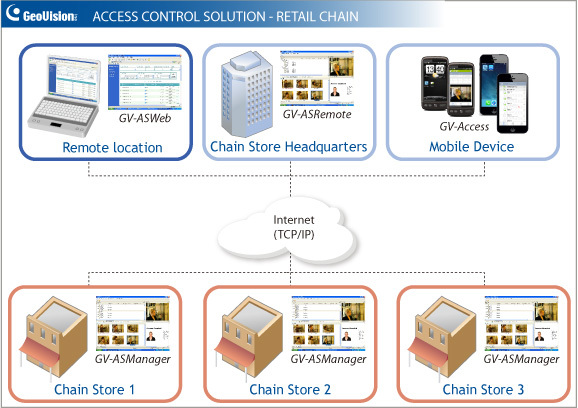 Along with powerful access controllers and other hardware accessories, GeoVision offers a series of complementary access control software including the GV-ASManager, GV-ASWeb, GV-ASRemote, and GV-Access mobile applications to provide the flexibility and scalability for both local and remote access control. The diagram above shows how the access control software can be set up for a retail chain. GV-ASManager can be installed in local PCs of the chain stores and the headquarters can remotely monitor the chain stores using GV-ASWeb or GV-ASRemote. 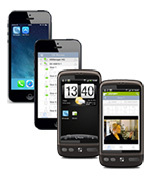 Using GV-Access mobile applications, up to 5 GV-ASManager systems can be accessed from a mobile device. The GV-NVR (Network Video Recorder) records video and audio data over TCP/IP networks. With up to 32 channels of pure IP surveillance, the GV-NVR offers the same functions as GV-Series Surveillance System. GV-Edge Recording Manger is a tool designed for recording management of remote GV-IP Cameras and GV-Target Cameras.